Reference number for this case: 5-oct-54-Beaumont. Thank you for including this reference number in any correspondence with me regarding this case. 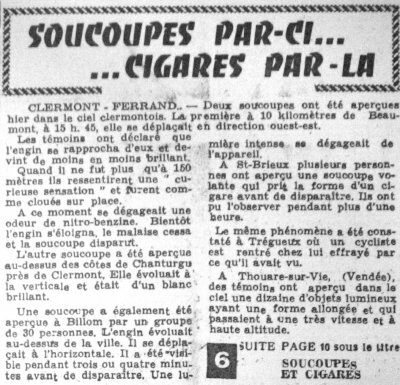 The author indicates that on October 5, 1954 at 15:45, within 10 kilometers of Beaumont in the area of Clermont-Ferrand a discoid craft was observed by various witnesses. The craft approached them and became less shining. When the craft was at no more than 150 meters of them, they " had a curious feeling and were fixed on the spot". A nitrobenzene odor came at this time. When the craft moved away, the bad feeling ceased. The magazine said that at 3:45 p.m. on October 5, 1954, at the height of the spectacular European "landing wave" of that autumn, a luminous UFO was seen a few miles from Beaumont (north of Paris). This object approached the witnesses, at the same time losing altitude, and the witnesses were unable to move and noticed a nitrobenzene smell. The author says that on October 5, 1954 in Beaumont, near Paris, France, as a Luminous UFO approached to within 150 yards of eyewitnesses they reported that they felt a strange sensation "as if nailed to the ground." In addition to the temporary paralysis, the witnesses noticed the UFO gave off a peculiar smell. Jacques Vallée indicates that on October 5, 1954, at 03:45 p.m., according to the Press, people who were 10 kilometers from Beaumont near Clermont-Ferrand in the department of Puy-de-Dome described a "machine" which lost its luminosity while approaching them. When the machine arrived at 150 meters from them, these people have felt a "curious feeling" and were like "frozen on location." These people also "smelled a strong odor of nitrobenzene." Oct. 05, 1954, 03:45, Beaumont (France). Ten km from Beaumont, several persons saw an object coming toward them and getting brighter. When it was about 150 m away, they felt "a strange sensation" and found themselves unable to move. The object left a smell compared to that of nitrobenzene. 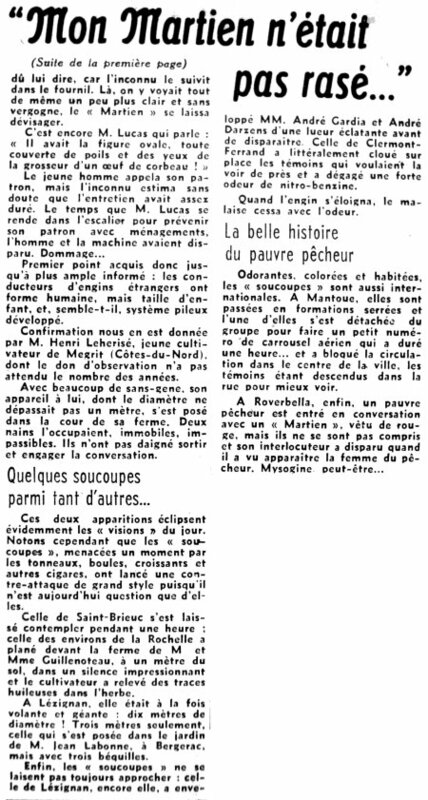 (Franc-Tireur, la Croix, France-Soir, le Figaro, 7 octobre 1954. 34; Challenge 53). 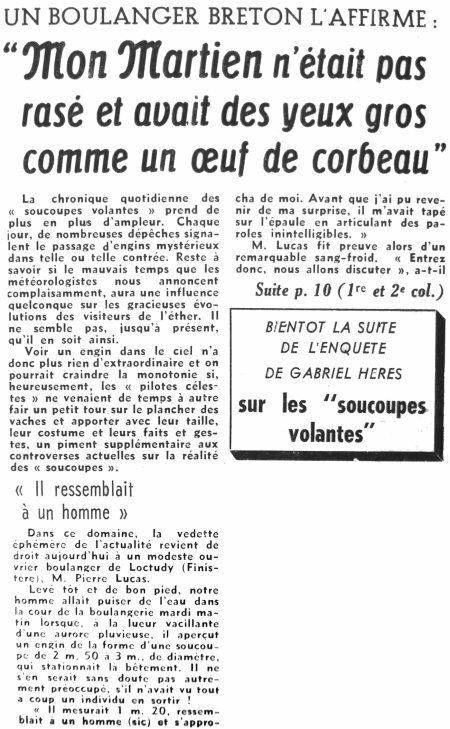 The author indicates that on October 5, 1954, within approximately 10 kilometers of Beaumont, close to Clermont-Ferrand, several people saw an object coming towards them while becoming increasingly brilliant. When it arrived at some 150 meters from them, they felt a "strange sensation" and were unable to move. The object left an odor which was compared with that of nitrobenzene. The magazine indicates that on October 5, 1954, at 03:45 P.M. in Beaumont, Puy-de-Dôme, Messrs Brun, Marfaron, Doutin, and Marplat saw at 500 meters away of them a luminous ball moving from the West to the East a few kilometers of Beaumont. The ball then approached within 150 meters of them. They felt nailed on the ground by a faintness, while a nitrobenzene odor spread around them. After having evolved vertically above them, the luminous ball disappeared. The magazine indicates that this case was reported by the newspaper La Montagne for October 6, 1954. In his chapter on the cases of paralysis or drowsiness of UFO witnesses during their experience, Pierre Delval indicates 12 cases from the French flap of 1954, among those, that in Beaumont in the department of the Puy-de-Dôme on October 5, 1954 à 03:45 p.m.
Brun, Marfaron, Doutin and Marplat saw within 500 meters of them a luminous ball which moved on a west-east trajectory, and which suddenly approached them. When the ball arrived at 10 meters from them, they realized that they were "paralyzed," and that they experienced a kind of weakness while, in the air, a nitrobenzene odor spread. After having evolved above their heads, the ball disappeared in the sky. 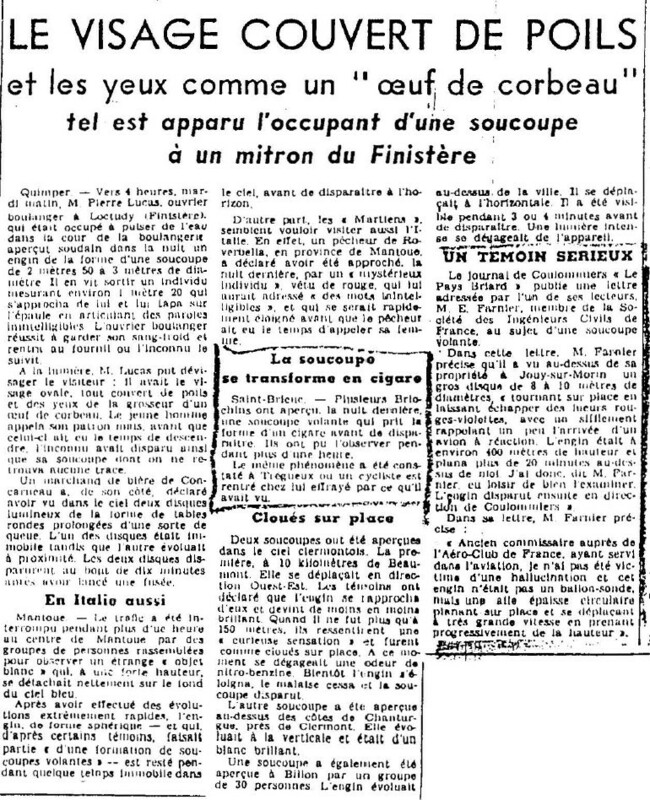 The Australian ufologist indicates that on 5 October 1954 near "Clemont-Ferrand" in France several persons saw an object approaching. When 150m away they felt strange sensation and found themselves unable to move. The source is noted "Bowen, C. 1969. The Humanoids. Neville Spearman. London. p37". The author says that on October 5, 1954 a luminous saucer was sighted ten kilometers away from Beaumont, France, and witnesses described an odor like that of nitrobenzene. Several witnesses were amazed as an object descended out of the daytime sky. The thing was glowing, but with less and less intensity as it approached. As the distance was reduced to about 150 meters the witnesses experienced a "curious sensation," a paralysis of some sort, also a smell, like nitrobenzine was noticed. 53. 53. Paris, France. Le Figaro. 7 October 54. Ten km from here, several persons saw an object coming toward them and getting brighter. When it was about 150 m away, they felt "a strange sensation" and found themselves unable to move. The object left a smell compared to that of nitrobenzene. Donald Johnson indicates that on October 5, 1954, ten kilometers from Beaumont, France several people saw an flying object coming toward them and getting brighter at 3:45 in the afternoon. When it was about 150 meters away they felt "a strange sensation" and found themselves unable to move. The object left a smell compared to that of nitrobenzene. Donald Jonson indicates that the source is Jacques Vallee, Passport to Magonia, p. 218. Luc Chastan indicates that in the "Puy de Dômes" in Beaumont on October 5, 1954 at 15:45 hours during a walk four residents of Clermont see at 500 meters of them, a luminous ball which evolves from East to West, a few kilometres from Beaumont. When the machine approaches the witnesses, it becomes less luminous and gained speed. Arrived at 150 meters of them, they feel a particular feeling and "are frozen on the spot". All around them there is a nitro-benzene odor. A few moments later, recovered from their faintnesses, they see the luminous ball evolving vertically above their heads and disappear. Luc Chastan indicates that the sources are "Les Universons by Poher Claude ** http://www.premiumwanadoo.com/universons/" and "Ovni, Premier dossier complet... by Figuet M./ Ruchon J.L. ** Alain Lefeuvre pub. 1979." Jérôme Beau indicates that on Tuesday, October 5, 1954 at 15:45 people being 10 km from Beaumont, close to Clermont-Ferrand, in the Puy-de-Dome, "describe a machine approaching them losing some of its luminosity (to become increasingly brilliant?). When it is 150 m from these people, they feel a curious feeling and are nailed on the spot. They also feel an odor similar to that of the nitrobenzene." 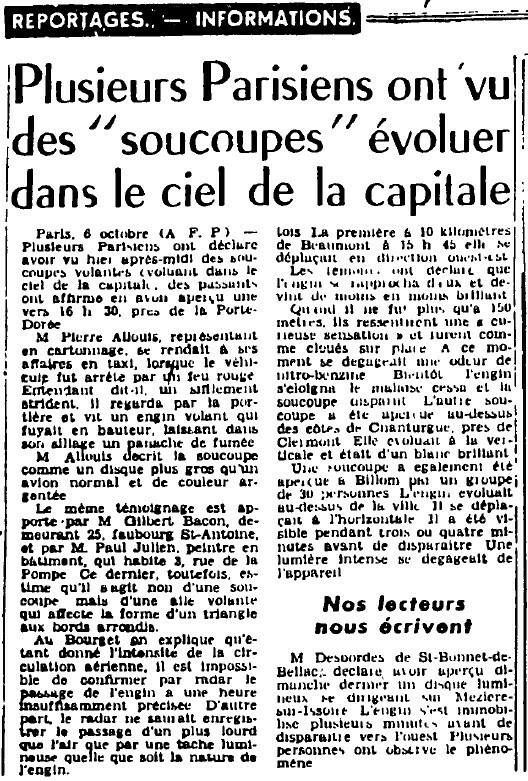 The sources are indicated as Franc-Tireur, La Croix, France-Soir, Le Figaro October 7, 1954; Vallée 1966, 53. The website indicates that on 5 October 1954 at 15:45 in Beaumont 10K, France, observers felt "strange sensation" and cannot move. A UFO at "50m altitude, flies W rapidly to the east. Nitrobenzine odor." An object was sighted that had an appearance and performance beyond the capability of known earthly aircraft. One object, around 100 feet away, was observed by several witnesses on a farm for 100 minutes. The sources are indicated as Guieu, Jimmy, Flying Saucers Come from Another World, Citadel, New York, 1956; Bowen, Charles, The Humanoids: FSR Special Edition No. 1, FSR, London, 1966; Vallee, Jacques, Computerized Catalog (N = 3073); Vallee, Jacques, Challenge to Science: The UFO Enigma, Henry Regnery, Chicago, 1966; Vallee, Jacques, A Century of Landings (N = 923), (in JVallee04), Chicago, 1969; Newspaper Clippings; Hatch, Larry, *U* computer database, Author, Redwood City, 2002. The website indicates that on 5 October 1954 at 15:45, in Beaumont, France, an object paralyzed witnesses. "Ten kilometers from here, several persons saw an object coming toward them and getting brighter. When it was about 150 meters away, they felt "a strange sensation" and found themselves unable to move. The object left a smell compared to that of nitrobenzene." The source is noted: "Vallee Magonia Database". *Oct. 5, 1954 - Ten kilometers from Beaumont, France several people saw an flying object coming toward them and getting brighter at 3:45 in the afternoon. When it was about 150 meters away they felt "a strange sensation" and found themselves unable to move. The object left a smell compared to that of nitrobenzene. (Source: Jacques Vallee, Passport to Magonia: A Century of Landings, p. 218, case # 199). Nitrobenzene (C6H5NO2) is formed using nitric acid and benzene, it is very poisonous, used to produce aniline used in dye, and used in perfumed for its bitter almond odor. [fu1] Fantastic Universe science fiction magazine, USA, Volume 9, 1958. [gf1] "Flying Saucers Are Hostile", article by George D. Fawcett, in Flying Saucers Magazine, USA, February 1961. [jv3] "Les Phénomènes Insolites de l'Espace", book by Jacques Vallée, La Table Ronde publisher, 1966. [jg1] "Black-Out Sur Les Soucoupes Volantes", book by Jimmy Guieu, Omnium Littéraire publisher, France, page 194, 1972. [pd1] "Le Grand Livre des Objets Volants Non-Identifiés", book by Pierre Delval with the Oranos Committee, De Vecchi publisher, page 251, 1976. [jv3] "Les Phénomènes Insolites de l'Espace", book by Jacques Vallée, Robert Laffont publisher, page 75, 1978. [dc1] "The Unspeakable and Others", book by Dan Clore and S. T. Joshi, Wildside Press LLC publishers, USA, page 251, 2001. 0.1 Patrick Gross March 24, 2006 First published. 1.0 Patrick Gross January 6, 2009 Conversion from HTML to XHTML Strict. First formal version. Additions [dj1], [lc1], [jb1], [ud1], [ud2]. 1.1 Patrick Gross March 12, 2010 Addition [jg1]. 1.3 Patrick Gross July 1, 2010 Additions [fu1], [dc1]. 1.4 Patrick Gross August 15, 2010 Addition [lm1]. 1.5 Patrick Gross December 18, 2016. Additions [lg1], [ub1]. 1.6 Patrick Gross January 9, 2017 Additions [hm1], [pc1].